In this video, Dr. Huntoon discusses the reason for Chronic Fatigue and what you need to be aware of to address it. Traditional Allopathic Medicine does not have a solution other than medication that has harmful side-effects. We are here to help you address the underlying CAUSE of Chronic Fatigue Syndrome by educating you to that specific cause. Once you understand what is creating your Chronic Fatigue, you can then begin on the road to health and wellness and put this difficult chapter in your life behind you. 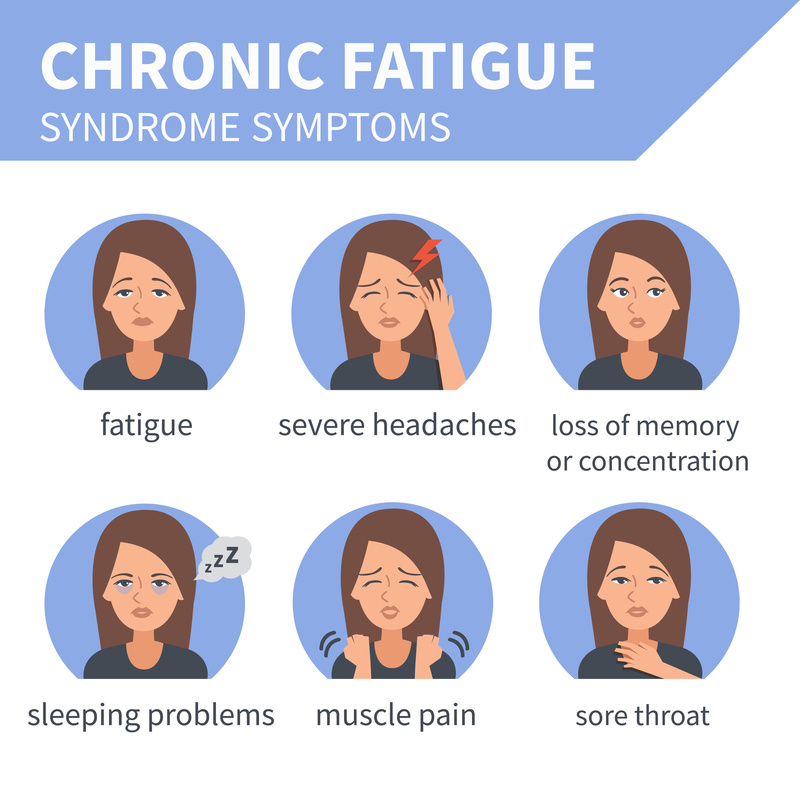 CFS; Fatigue - chronic; Immune dysfunction syndrome; Myalgic encephalomyelitis (ME) Chronic fatigue syndrome refers to severe, continued tiredness that is not relieved by rest and is not directly caused by other medical conditions. The exact cause of Chronic Fatigue Syndrome (CFS) is unknown from a Traditional Allopathic Medical perspective. There are also some theories about the Myalgic encephalomyelitis (ME) 150 virus. This is the official opinion of the CDC. However, no specific virus has been identified as the cause from a Traditional Medical perspective. Beyond these viruses, another theorized cause is inflammation in the nervous system due to a faulty immune system response. CFS is most commonly diagnosed in women ages 30 to 50. There is currently no cure for CFS from a medical perspective. The goal of treatment is to relieve symptoms, as many people with CFS suffer from depression and other psychological disorders that may improve with treatment. This will usually require being prescribed medication. When medications are involved, remember that in some people they can cause reactions or side-effects that are worse than the original symptoms of the disease. Always know what to look for before taking any medication prescribed. Be sure to read the information that comes with your medication, especially the side-effects and complications associated with the medication. Relaxation and stress-reduction techniques can help manage chronic pain and fatigue. The long-term outlook for patients with CFS varies and is difficult to predict when symptoms first start. Some patients completely recover after 6 months to a year, while others may never feel like they did before they developed CFS again. There is hope though, as studies suggest that you are more likely to get better if you receive extensive rehabilitation. Appreciate that none of this sounds very promising. This is why we recommend Alternative Medical Treatment. Continue reading below. Dr. Huntoon has seen far too many patients with Chronic Fatigue Syndrome over the years and each one has demonstrated having the ME 150 virus. Having learned a specific technique to treat and resolve CFS using Total Body Modification (TBM), Dr. Huntoon is confident the underlying cause is the ME 150 virus. Once treated and resolved, then restoring health and balance to the person who has suffered becomes vital to full resolution of that person's health. "I started seeing Doc Rick in the last couple of months. I had been having various health problems, including fatigue, digestive issues, and difficulty sleeping. I had been trying to work around them while keeping up my schedule but over the course of a year or more they continued to gradually deteriorate, and there was nothing I could do about it. I have probably seen 6 or 7 medical practitioners before Doc Rick and none of them really helped me. As a practitioner of alternative medical treatment, Doc Rick gets to the root of the problem, solving it for good, rather than simply addressing the symptoms. Within the first few visits, he was able to identify 18 (!) areas where my body lacked good health. Until the last year I was a young male who seemed in "very good health" who tried his best to take very good care of himself. But due to the environment I (and all of us) live in, and the habits that can easily spring up due to that, the issues cropped up. Doc Rick has vast knowledge and expertise on treating people's bodies to get them to optimal health. It is very impressive to hear him explain everything in minute detail-as you listen, you understand more and more that the body is an amazingly complex system and simple "one size fits all, symptom-masking" treatments make no sense at all. They will do more harm then good. His philosophy is to restore the body back to health then maintain that health. He uses treatment techniques along with educating you to tell you what you need to do. This review is mainly about the experience in Doc Rick's office, which is top-notch-mainly, everything is explained to you. If you have done research on some of the health issues I (and many others) have you will see that many have hit dead ends, are not getting better, are frustrated, and are resigned to living with their symptoms. Doc Rick explains why that is, and how one can overcome it. Yes, it takes hard work, it will cost some money, and certain life adjustments will need to be made, but what good things in life aren't worth working for? Particularly involving your health. In summary, go to Doc Rick if you are having chronic health problems of any kind and you are serious about making the needed changes to fix you long-term. This isn't for those looking for a band-aid." CFS can be a terrible condition as you can end up to tired to really enjoy life. With the underlying causes being unknown, and no traditional medical treatment available, many patients turn to a Holistic Chiropractor for help in managing their condition. Working with a Holistic Chiropractor can offer exceptional benefits, as using a well-rounded, multifaceted approach to addressing your health can lead to substantial life improvements. A properly developed personal treatment plan has demonstrated positive results. Patients with CFS are encouraged to maintain active social lives and may find mild physical exercise to be helpful. Your health care team will help you figure out how much activity you can do, and how to slowly increase your activity. We have also seen patients benefiting from Acupuncture, Homeopathy and Naturopathy when they followed the treatment guidelines set up by your practitioner. I will be happy to discussing what is involved, and the time commitment necessary for your personalized treatment. As traditional medical science continues to offer no solutions, if you or someone you love is suffering from CFS call me and I can help. There are no specific tests to confirm the diagnosis of CFS from a Traditional Medical Testing perspective. There have been reports of CFS patients having abnormal results on Brain MRI and White blood cell count tests. However not all patients with CFS will show abnormal results and therefore these tests can only be of limited help in establishing a diagnosis. Research into CFS, how to fully diagnose, and how to treat it is still ongoing. Call for an appointment with your healthcare provider if you experience persistent, severe fatigue, with or without other symptoms of this disorder. Other more serious disorders can cause similar symptoms and should be ruled out. Dr. Huntoon has 30 years of experience addressing the underlying CAUSE of this difficult health concern to final resolution. By applying the methods he has learned using the 7 Pillars of Health to address all the components associated with your CFS, this has continued to create healthy outcomes. Developing a healthy lifestyle with proper guidance from your Holistic Chiropractor is the best prevention when considering how to approach your health. Addressing the underlying reason for your Chronic Fatigue (the ME 150 virus) and addressing all the ways your unique form manifests is the best thing you can do to restore your health and get on with your life. Dr. Huntoon is happy to consult with you through this process. Let's work together to restore your health. People have also benefited from acupuncture, Homeopathy and Naturopathy.